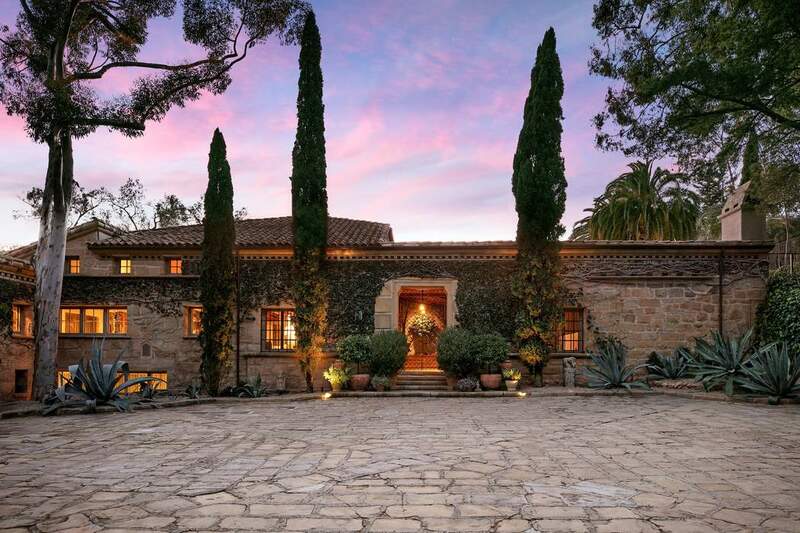 Ellen DeGeneres and Portia de Rossi are selling their romantic villa in Montecito California. Ellen’s estate, built in the 1930s, has ocean, harbor, and mountain views. The 17th century Italian villa features a barrel-tiled roof, terra-cotta surfaces, wide wood flooring planks, rustic exposed ceiling beams, 18th century Italian tiles, vintage light fixtures, and sturdy walls of quarried stone. The 16.88 acre Tuscan estate includes 6 bedrooms, 6 baths, 9 fireplaces, a media room, multiple libraries, a regal living room, a formal dining room, a kitchen with marble-wrapped surfaces and stainless-steel appliances, stone terraces, and exquisite landscaping. Recent additions include a modern entertainment pavilion known as Jordan Hall, a lap swimming pool, and a tennis court. Let’s take a peek inside Ellen and Portia’s home. The living room with exposed beams. The exposed beams continue into the dining room. With views of the ocean…of course. And to top it off…a tennis court! And what would it cost you to own this Tuscan dream? A cool $45 million. Want to see a video tour of Ellen’s home, check this out HERE. Stay tuned for a home tour of Ellen’s newest estate next time. Remember to subscribe to get biweekly posts delivered right to your inbox, and follow along on Instagram HERE. Feel free to tweet, pin, repost or email. See you next time! Ellen is one of my favorite people! Wow, what a house! Looks like a Tuscan castle! Thanks for sharing.